One of the financial computation that I find hard to understand is the idea of Rule of 72. I first encountered the concept in other financial blog and I did try to understand it but I failed. 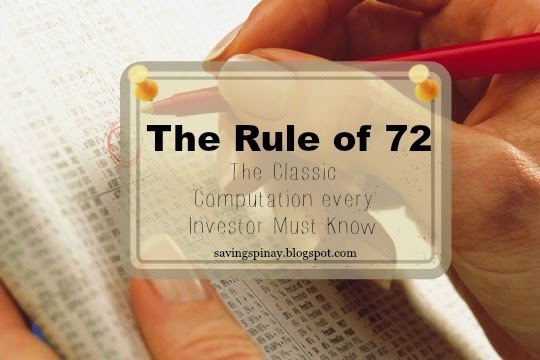 The Rule of 72 shows the future computation of your money. It simplifies how to determine when will your investment doubles with just a given fixed annual rate. The formula is just division. It says that as long as you divide the number 72 to the fixed annual interest rate then you’ll get the number of years that your money (investment) will double. 72 divided by 5 = 14.4 years for my 1000pesos to become 2000pesos. Say for example the amount of money that you want to retire with is 2 million pesos. Now the most common annual interest rate for this example will be 4, 8 and 12. If we use the Rule of 72 at the current investment that you have let’s say 100,000pesos and your age now is 25 then we can clear out how harder you need to go in order to retire the way you wanted. Why The Rule of 72 Matters? Just like what I revealed in the introduction, I first learned about this double your money computation on other financial blogs that I visit almost every day but it was actually when I attended the Series 1 Seminar of IMG Wealth Academy that I realized how powerful Rule of 72 is. 1. It can develop a clear picture of where you want to go. 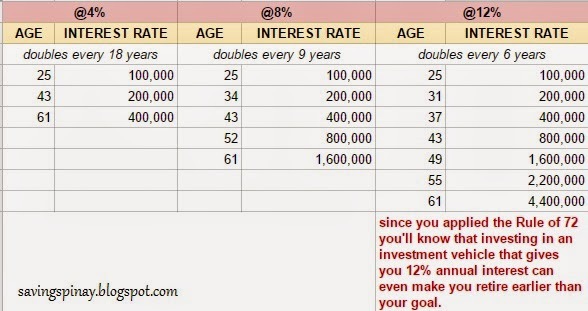 On the above example you have a clear idea on how many years it will take for you to reach your goal, at what age your goal will be doable and at what investment rate will have much more valuable return. 2. Enables you to become strategic in your investments. Using the Rule of 72 empowers you to design a program that will outpace inflation. 3. It helps you choose the savings plan that will work best for your and your budget. You won’t choose an investment plan for your goal that will take you a lifetime to have an answer. With the help of Rule of 72 you can choose better for your investments. Now this computation is just to determine how many years will it take for my opening fee to double. This means that your additional investments will have a separate computation. I suggest doing this Rule of 72 every end of the year so that you’ll have an idea as to how many you have currently have and how many years more for it double. I hope this post helped you. Does knowing the Rule of 72 helped you? !